Good Choice Reading: Help bring Jennifer L. Armentrout and Pepe Toth (AKA Daemon Black Cover Model) to HOUSTON! 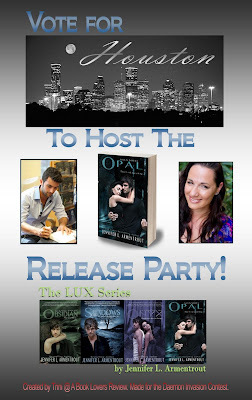 Help bring Jennifer L. Armentrout and Pepe Toth (AKA Daemon Black Cover Model) to HOUSTON! I know some of you are wondering why am I helping Houston out and not my own town. LOL! Well, to tell you the truth I didn't really have time to participate in this or vote for my town etc. I've been talking to Trini @ A Book Lovers Review and for days she was killing her brain trying to come up with ideas to get HOUSTON votes! She has worked so hard on this and I decided to help her out in voting and spreading the word. Houston is one of the finalist! VOTE FOR HOUSTON, TX! Only five cities made it to the finals and Houston is one of them. If you live in or around Houston area make sure to vote for us. Please use hashtag #DaemonInvasion to help get your friends to vote for Houston! Voting Ends November 13th at midnight PST so hurry on over!